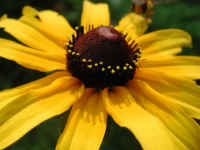 (Black-eyed Susan (Rudbeckia serotina) - 01) The Black-eyed Susan is the state flower of Maryland and is found throughout the United States. There are about 90 varieties. 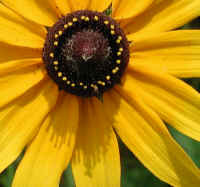 The Black-eyed Susan is the best known of the Coneflowers, so named because their centers are cone shaped and the petals bend downward from the center which accentuates the cone. (Black-eyed Susan (Rudbeckia serotina) - 02) The various varieties of Black-eyed Susan can have from 10 to 20 petals radiating out from the base of its dark brown central disk (black eye). 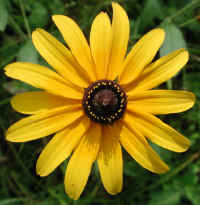 The flower of the Black-eyed Susan develops on the end of the stem. They bloom from June to October. 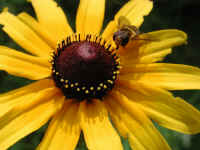 The literature indicates that extracts from the Black-eyed Susan have antibiotic properties, and the flowers have been used by herbalists to treat skin infections. 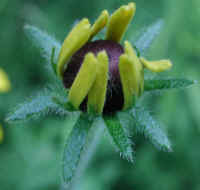 (Black-eyed Susan (Rudbeckia serotina) - 03) This photo shows the opening of the bud of the Black-eyed Susan. Note that the petals are very narrow as the flower begins to open. It can take a couple of days for the petals to swell to their full width. 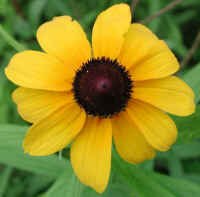 The Black-eyed Susan is a member of the Composite family. 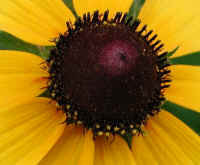 (Black-eyed Susan (Rudbeckia serotina) - 04) This enlarged photo gives us an excellent view of the structure of the central cone or black eye of the Black-eyed Susan, and hopefully gives a greater insight into the magnificence of God's creation, down to the minutest detail. May we cherish these gifts and strive to preserve them. (Black-eyed Susan (Rudbeckia serotina) - 05) This is another black-eyed Susan that we spotted just off the side of the road. 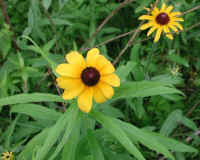 The black-eyed Susan was originally a native of the western United States, but it was introduced to the eastern United States in samples of clover seed. 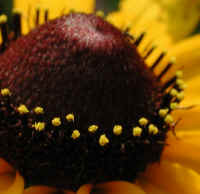 (Black-eyed Susan (Rudbeckia serotina) - 05a) When viewed from the top, the disk flowers of this black-eyed Susan appear to be flat as a button, but the shadow cast below the disk indicates otherwise. (Black-eyed Susan (Rudbeckia serotina) - 06) When viewed from the side, the disk flowers can be seen to form a cone. 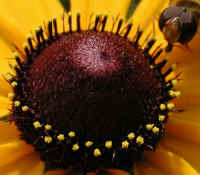 (Black-eyed Susan (Rudbeckia serotina) - 06a) This is a bee's eye view of a portion of the disk flowers of a black-eyed Susan. (Black-eyed Susan (Rudbeckia serotina) - 07) This black-eyed Susan has a visitor. 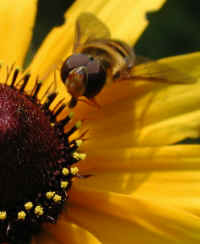 (Black-eyed Susan (Rudbeckia serotina) - 07a) When we mention a bee's eye view, this is what we're referring to. (Black-eyed Susan (Rudbeckia serotina) - 07b) This is another view of the cone-shaped disk of the black-eyed Susan.